Surprise: Strike the enemy in a time or place or in a manner for which he is unprepared. There isn’t that much to expound upon when discussing this Principle. Surprise is surprise. Here, we’re not talking about changing the rules mid-game; the old, ‘oh that’s not area terrain providing a 4+ cover save like we’ve been playing the whole game, now that my beardy unit is in range, it’s just true line-of-sight’ trick. That’s just poor gamesmanship and makes for cross opponents. Here, we’re talking about taking an action that will throw your opponent off his game by forcing him to react in a very dramatic manner. Presenting him with an option he simply cannot ignore, because if he does, it could cost him the game. He literally has to set aside his plans and react. Frankly, there is no better way to throw your opponent’s pacing off than to do something completely unexpected. We’ve already covered Deep Strike and Outflanking as decisive ways of seizing the initiative. Fifth Edition has made Outflank so incredibly powerful it should almost be a staple of at least one unit in every army. Couple it with a potent central threat that drives your opponent’s army towards the edges of the board makes it even better. Variations on the Deep Strike rules work well. Drop Pods, Guardsman Marbo, Ork Commandos, Lictors, and the infamous Callidus Assassin, can all wreak havoc on your opponent’s battle plan, forcing him to react instead of act. There is a negative aspect to the Principle of Surprise. What happens when you are surprised in a big way? We’re not talking about a Lictor or Marbo in this case, we’re talking a surprise so big it might shake your confidence. If you’re a tournament player, this has most likely happened to you. You’ve completed your first round and are sidling up to the table for the second round. You’re taking up the friendly pre-game banter with your opponent when he asks what army you’re playing. You reply that you’re playing ‘Army X’. You can see some of your opponent’s miniatures now, and they look a little strange to you. Your curiosity piqued, you ask your opponent what army he is playing and he responds that he’s playing ‘Army Q’. Uh Oh. You’ve heard of ‘Army Q’ one time in passing about four years ago. 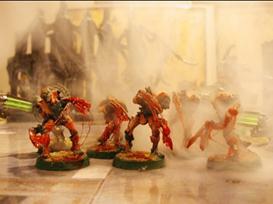 In fact, as far as you can remember, you thought that they were eaten by Tyranids in the fluff or something like that. When did they get a new codex? What can they do? You don’t know. Don’t panic. While you don’t know what they can do, hopefully you know exactly what your army can do. Control the controllable. And now you need to gather some intelligence. Fast. Turn on the charm. 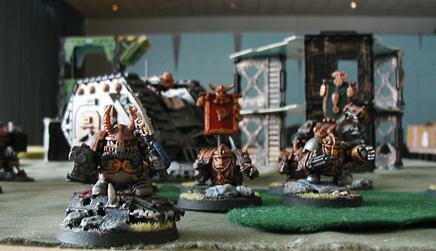 We 40K players love to talk about our armies so engage your opponent while you are both setting up. Ask him about his army. Trust me, he’ll tell you. Listen, really listen, to him. Folks get excited when they have a cool unit that they are planning to use to do something dirty to your army. Look for cues and clues on the miniatures themselves. Chances are that the elaborately painted miniature sitting atop a scenic base and with the hand-painted banner isn’t just a grunt. If you’re playing an objective mission, which units are his troops? In the end, if you’re still not sure, ask to take a look at his codex. A really good way to get someone to talk about their army in a very quick ‘threat/response’ manner is to tell them that you’re thinking of starting to play your own ‘Army Q’. Then ask them their opinion of what you should use. You will probably get a philosophy lesson in the tactics and list strategies of ‘Army Q’. But now, hopefully you’ve lessened your surprise quite a bit, made a new friend, and maybe even talked yourself into starting an ‘Army Q’ collection. Another aspect of Surprise, is a maneuver called the ‘reveal’. It’s a term borrowed from chess, where one piece will move out of the way suddenly ‘revealing’ another piece, usually the queen or a bishop, as a threat. Same thing goes in 40K. That Rhino you’re using to screen that Tactical Squad, can easily move out of the way, revealing a hail of rapid fire onto a squad that was maneuvering to assault it. A slight variation on this is the ‘bait and switch’. Where you hang a ‘popcorn’ unit out as bait for a unit you need to kill. The hope is that the opponent will take the bait and either assault the first unit or change his position to make it more favorable for you to attack it on your terms. We can characterize those faith abilities and the Imperial Guard orders as force multipliers. And force multipliers tie in directly with the Principle of Economy of Force our final Principle of War for this discussion and thought exercise. But until next week, what are your favorite methods of surprising an opponent? How do you ensure that the enemy is unprepared when you strike him at a time and place of your choosing?